I knew I wanted to make a fall centerpiece. 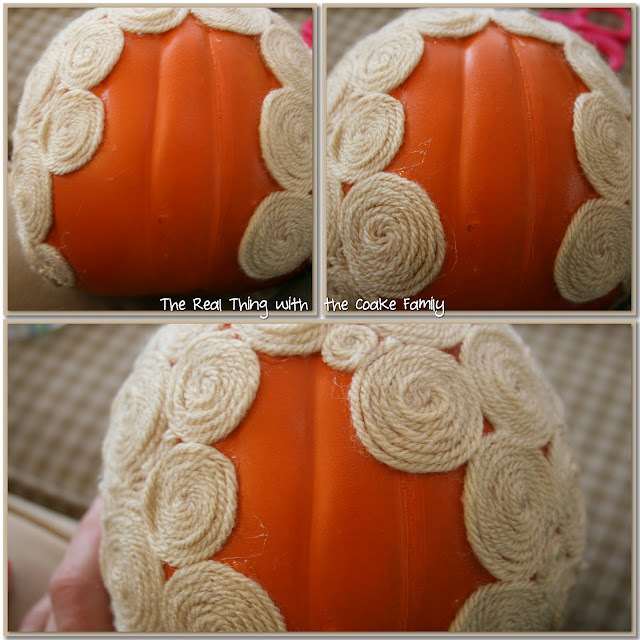 Recently I saw a blog post about making yarn wrapped pumpkins and gourds. Yarn Wrapped Gourds & Pumpkins from Two Shades of Pink. 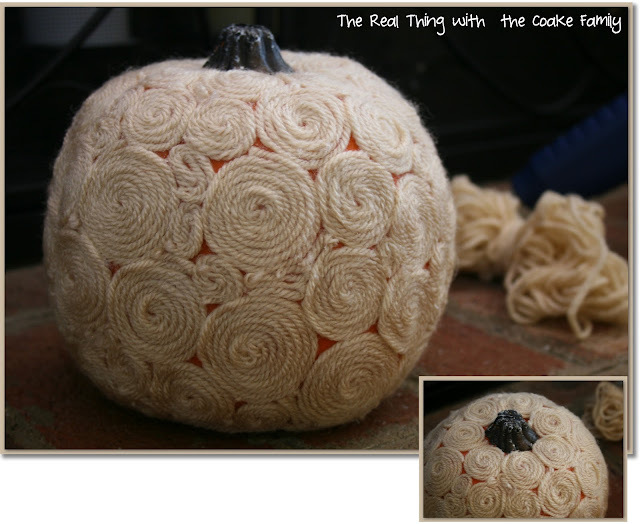 I loved the rosette yarn wrapped pumpkin she showed. 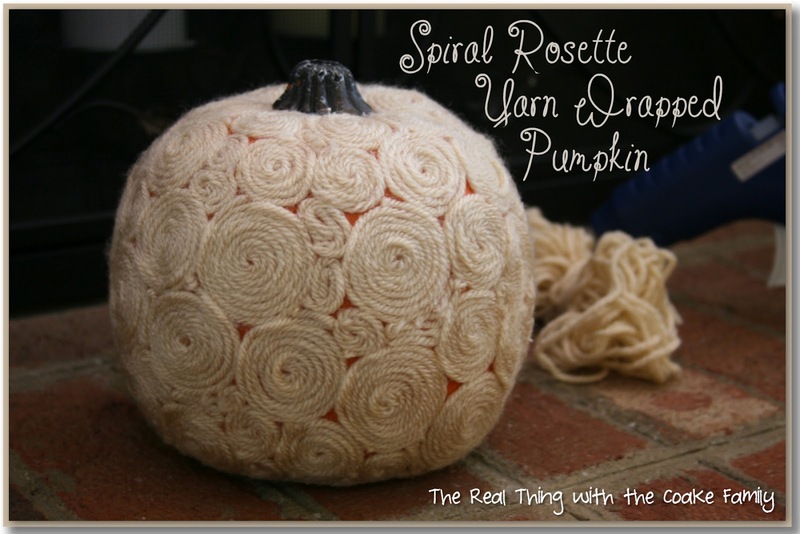 Of course I pinned the post, but I had a mental image of the pumpkin and never went back to see the details of how she made her spiral rosettes. My method worked fine, but I looked later and saw her suggestions. They look like they would work well and not involve hot glue, which is always a plus in my book. You can see my method below and you can also click over to her blog to see her method. Two things I will tell you about this project. 1. Expect it to take you a while…it is not a fast project. 2. If it bothers you to have a different color peaking out from behind your yarn, either buy a white pumpkin or use a darker color yarn. I started with a pumpkin from the craft store (of course it was bought with my 40% off coupon + my educator discount). I had yarn left over from other projects (shocking….I know). As you can see above, I just wound the yarn into a rosette. I was surprised that after the first turn or two, it actually would hold the swirl shape. Next up, put hot glue on the pumpkin a bit away from the nearest rosette and in about the size of the current swirl of yarn. 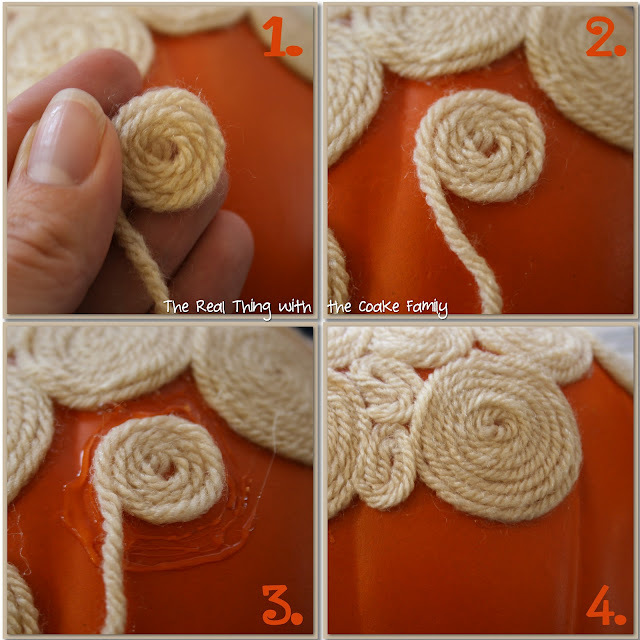 Add more glue around the swirl and continue to add yarn until it fills the space in which you placed it. The way I did it, they won't all come out to the be same size. I used small swirls to fill in the odd spaces. I thought it might be helpful to see how I filled in a side of the pumpkin. Below is that progression. As you can see I used a mix of different sized rosettes. Just figuring out what size I needed to fill in space as I went. After about 2+ hours and a few burnt fingers (I really don't like hot glue)…I had a pretty pumpkin ready for my fall centerpiece. The orange peaking through slightly bugs me and it's not as ‘perfect' as I pictured it would be, but overall, I think it is pretty. 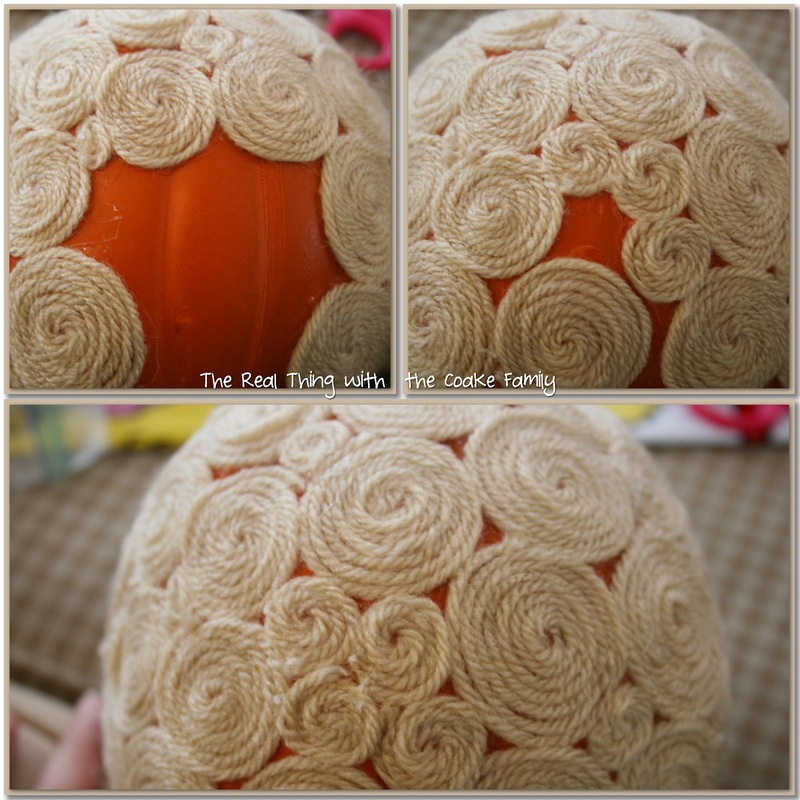 You can see how this pumpkin features in my Halloween/Fall Centerpiece and in my Fall Centerpiece. I love the look of these! Swirls of yarn?! How clever are you? Great job! 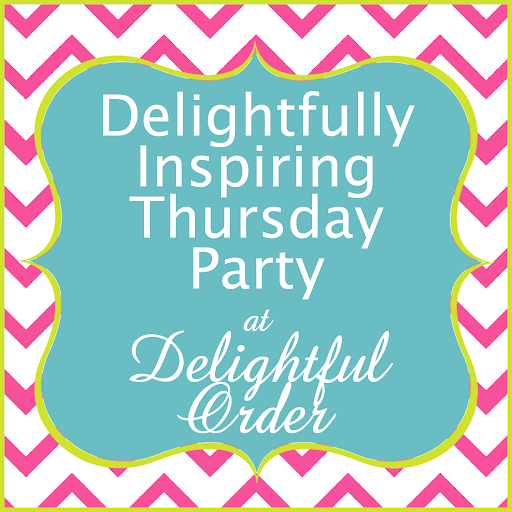 Thanks so much for joining the party over at Mighty Crafty! Thank you! Of course, I din’t come up with the idea, hopefully you saw the link to the creator of the idea. I just took the time to make one…Thanks so much for stopping by. What a unique idea! That’s a cute pumpkin! That is so pretty and WOW you must really have patience! Thank you! It wasn’t too bad. I did break it up into a couple of sessions and of course watching some TV was a necessity, but I so rarely sit still and watch things anymore, it was actually kind of nice. Wow! I’m glad you used a pumpkin that can be saved. That looks like a ton of work (but it was worth it). I just saw this on A Bowl Full of Lemons, and I love it! 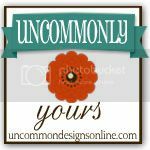 If you haven’t already, I hope you’ll visit “One Creative Weekend” on OneCreativeMommy.com today (or any time Fri-Wed) and link up! Yes, I can’t see making this and not being able to save it, though the original idea came from someone who did all that work and it was on a real pumpkin. 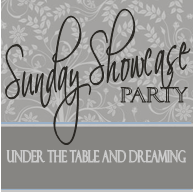 Thanks so much for the invite. I’ll head over as soon as I have a minute. Oh, I like the orange showing through. I think your pumpkin is adorable! I’ve never seen any done with yarn. I think I might do the same, I went to Dollar Tree today and picked up some pumpkins, had planned on painting them but now I see yours and have about decided that I would like to do some like you. 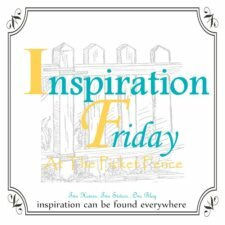 If I do, I’ll certainly link back to you for my inspiration. Thank you! I would love to see yours if you do make some, so please let me know. Glad I could provide some inspiration! Enjoy! This is gorgeous! I really like the little bit of orange showing through with the text of the yarn at the forefront. Great job. This is so cute! Love it! I may just have to make this! Thanks for sharing! Thank you! 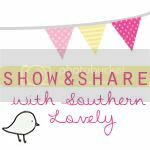 I would love to see it if you make one…would be fun to see more and how we each put our own twist on them! So cute! I love yarn! Visiting from Somewhat Simple. I love yarn, too! I can be a bit addictive all the things that it can do! Thanks for stopping by. Love that- such great texture! I love the look of this! I never thought to make rosettes with yarn before. Thanks for the inspiration! Awww, your welcome! Thanks for taking a look. Your pumpkin is lovely! What a great idea! Love the way this looks! Great idea! First time here and I am in love with this! Cant wait to look around. Aww… thank you! 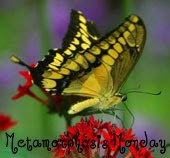 I hope you enjoyed your vist to my blog. This is such a cool idea! I love it! 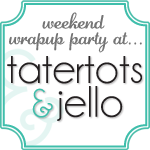 I’d like to invite you to share it at my party, Twirl & Take a Bow at http://www.houseontheway.com. I think it would make a great addition! You have such clever ideas!! So smart and easy for the fall decor!! Ohhh, Thank you! I don’t feel very clever, but I appreciate your sweet comments. This is so clever and cute!A must do! Thank you, that is very sweet of you to say. Such a cute idea!! I love it. This is amazing! So unique and pretty. 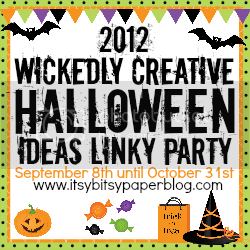 I hope you will link this up to my Wickedly Creative Halloween Ideas Party if you haven’t already. This is really adorable! I keep spotting it at the linkies and don’t know why it’s taken me so long to drop in and say wow! Love it! Will be featuring this little cutie tomorrow! I love the rosettes made from yarn, looks simple enough for me to do. 🙂 I’ve never done any of the other rosettes. Thanks so much! I think a painted pumpkin would be great, too…and it would save you 2 hours (or more) of your life. I love the look of this pumpkin, but it definitely took longer than I thought it would. 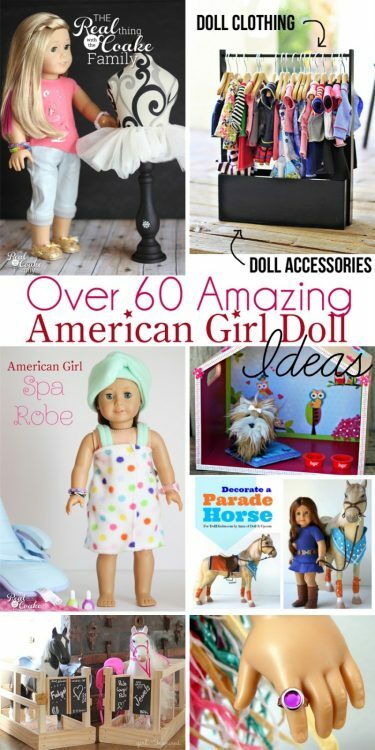 Thank you and Thank you so much for the feature! Have a great weekend. Thank you so much and thanks for your great link party as well! Thanks so much for both the feature and for letting me know you were featuring me. I really appreciate both! Enjoy your night. This is a really great idea. Pinned for next year. I enjoy the odd texture of this pumpkin. Thanks for sharing. 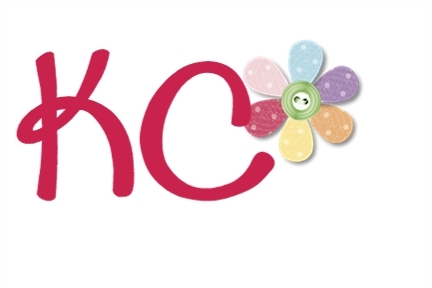 This is adorable KC! (although I hear you about the glue gun… I am forever burning myself too!!) 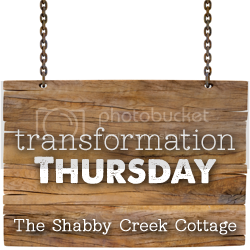 What a simple and cute project for Fall. 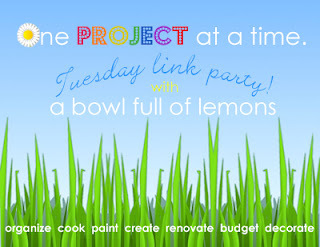 Thanks so much for linking it up to our Inspiration Galore Project Party last week. 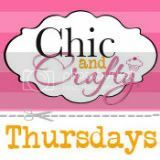 You are one of my Features tomorrow over at http://www.recreateddesigns.com. Have a lovely Fall weekend! I love this pumpkin idea. The swirls are perfect. Great idea.